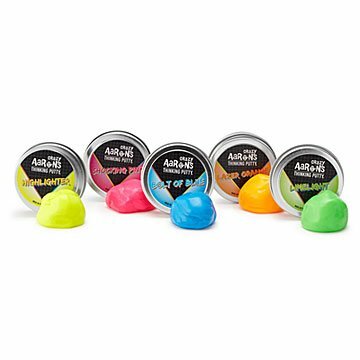 Enjoy the tactile fun of playing (or fidgeting) with this springy, bouncy putty in five pop art colors. Both an eyeful and a handful, this fluorescent putty is a cooler version of the bouncy goop you grew up with. It's springier, less sticky, and easy for kids to sculpt into bright temporary sculptures or desktop games. A fun fidget toy for adults, its pop art colors stimulate, while tactile play has a calming effect. And it won't stress you by drying out. Each of the five colors—Bolt of Blue, Limelight, Highlighter, Laser Orange, and Shocking Pink—comes in its own mini-tin. Made in the US. The colors are amazing! The packaging is beautiful. Then I opened the box and it had tiny tins--about the size of a silver dollar and only 1/2" tall. Inside was a very small amount of putty enough to cover the bottom of the tin by say a little more than 1/8" depth? So even the tiny tins were not full--just a small layer. Definitely purchase for the grown ups and not the little ones who like more than a small ball of putty.